RAINDROPS did not dampen the spirited defending champion University of Santo Tomas (UST) Team A lady booters who opened their title defense with a rousing 5-0 win over Davao City-based Sikat Alab Football Club (FC) in the 4th Pinay in Action (PIA) Cup football tournament at Tionko field, Barangay 76-A in Matina, Davao City Friday, January 11. 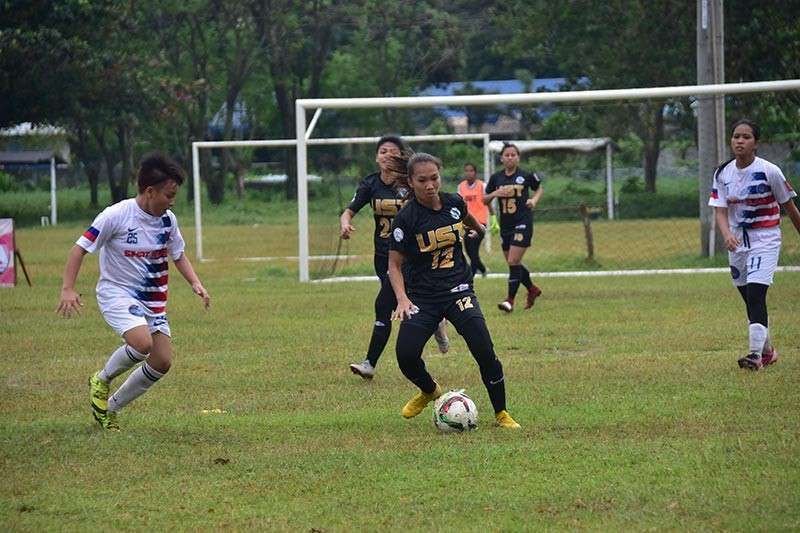 Hazel Lustan led scoring for UST Team A, knocking in two goals in the 13th and 16th minutes as Cecile Deite, Nathalie Absalon and Joy Abo-Abo scored one goal each in seventh, 34th and 36th, respectively. Only three senior players, she said, played during the game against Sikat Alab while the rest were rookies. The UST Team B also drew first blood by whipping the Dipolog Bad Bonitas, 14-1, in another match. The UST has been holding training camp in Davao City since last week in preparation for the University Athletic Association of the Philippines (UAAP) where it held the runner-up honors for the last two seasons. In other games, CR7 Food Truck bested Lianga Football Club of Surigao del Sur, 5-3, behind Michelle Javellana's hat trick and Agot Danton's brace; while Sky Warriors FC of Maco, Compostela Valley subdued University of the Philippines (UP) Mindanao, 1-0, and UP Women's Football Team Y of Manila crushed Baliwasan Redcorals United FC, 4-1. Ulticon Builders, Inc. is major sponsor of the league organized by PIA founded by Taguig Representative Pia Cayetano and also supported by SunStar Davao. The formal opening ceremony is set at 10 a.m. Saturday, January 12.